I call you "neighbor" because I don't know your name, or anything personal about you. Given our circumstances, "neighbor" might be too casual a word to describe our relationship. We are intruders into each other's dream, violators of each other's sense of home. We are incarnations of each other's worst historical nightmares. Neighbors? Letters to My Palestinian Neighbor is one Israeli's powerful attempt to reach beyond the wall that separates Israelis and Palestinians and into the hearts of "the enemy." In a series of letters, Yossi Klein Halevi explains what motivated him to leave his native New York in his twenties and move to Israel to participate in the drama of the renewal of a Jewish homeland, which he is committed to see succeed as a morally responsible, democratic state in the Middle East. This is the first attempt by an Israeli author to directly address his Palestinian neighbors and describe how the conflict appears through Israeli eyes. Halevi untangles the ideological and emotional knot that has defined the conflict for nearly a century. In lyrical, evocative language, he unravels the complex strands of faith, pride, anger and anguish he feels as a Jew living in Israel, using history and personal experience as his guide. 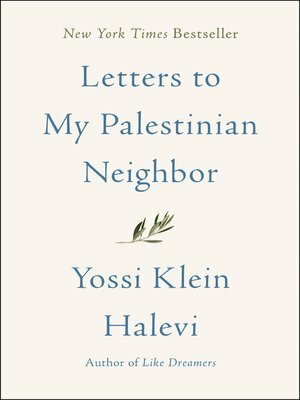 Halevi's letters speak not only to his Palestinian neighbor, but to all concerned global citizens, helping us understand the painful choices confronting Israelis and Palestinians that will ultimately help determine the fate of the region.